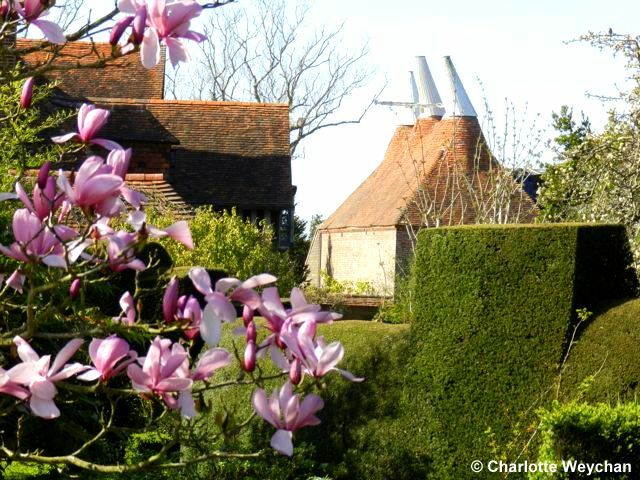 Great Dixter traditionally opens its doors at the end of March. And although it's early in the season, there's already a lot in bloom. The wildflower meadow is filled with daffodils; many tulips are out; and sadly, the magnolia blossoms are already falling to the ground. We've enjoyed unseasonally high temperatures here in Britain recently, so the garden here is well ahead of itself in terms of "flowering" this season, but it's a great opportunity to see the basic structure of this garden before it becomes such a mass of planting that you don't really appreciate the lay of the land. 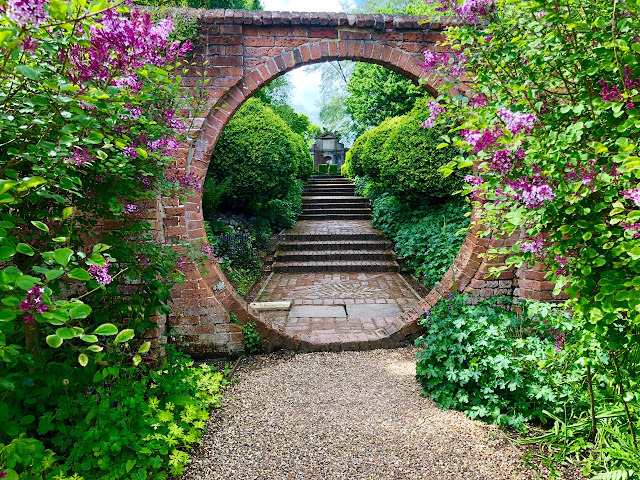 It doesn't matter how many gardens you've visited, because this garden can't fail to delight - former home of Christopher Lloyd, affectionately known to friends as Christo - it's one of the most enervating and different you'll see. The planting is unique; the colours are wonderful; and it's guaranteed to lift your spirits. From the moment you set eyes on the timber-framed house and walk across the meadow garden at the entrance, you'll see this garden is unique. By all means take a tour of the house, but as you enter, keep an eye out for the plants on the porch, maintained in Lloyd's tradition. He constantly changed the plants here throughout the season to make sure "there's always a greeting as one goes into or out from the house." Fergus Garrett is head gardener here. He worked with Christopher Lloyd right up to his death in 2006 and continues to run the garden as Christo did, maintaining his planting style, and keeping the garden full to the brim. If it's borders you're after ... the whole garden is one great exuberant display of shrubs, climbers, annuals and perennials, all mixed together in true Lloyd style. He maintained: "Different kinds of plants grown in juxta-position help each other". Well, help or hinder, they all look pretty fantastic here and as the season progresses the choice of plants ensures that the display becomes more and more dense. 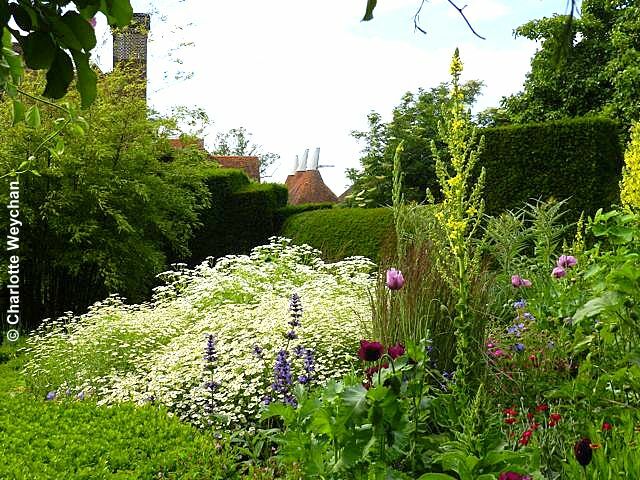 Many visitors will have heard tell of the famous Long Border at Dixter (above), but in reality the whole garden is a sight to behold and the High Garden is like one huge border, hidden behind the famous peacock topiary. 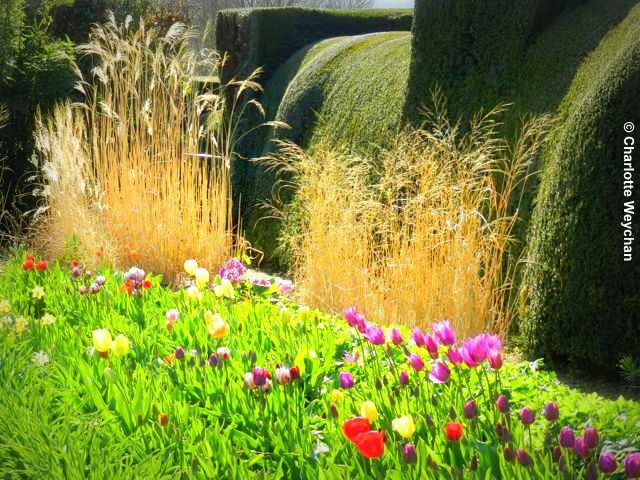 There is also the Sunk Garden, the Orchard Garden and the Exotic Garden. 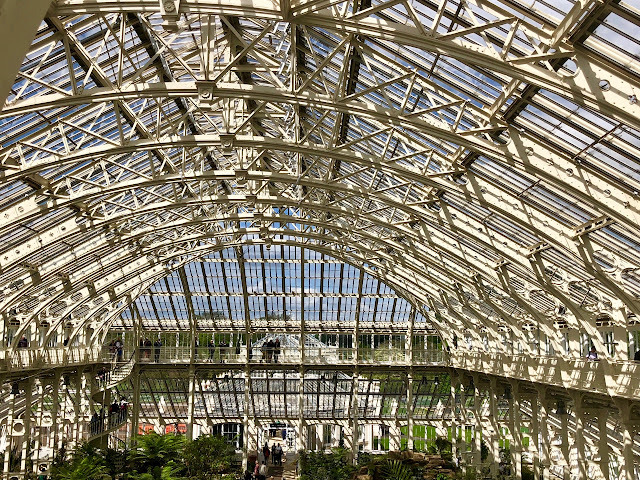 Entrance to the gardens is £7.50 for adults (£9.50 to include house) and £4.00 for children. 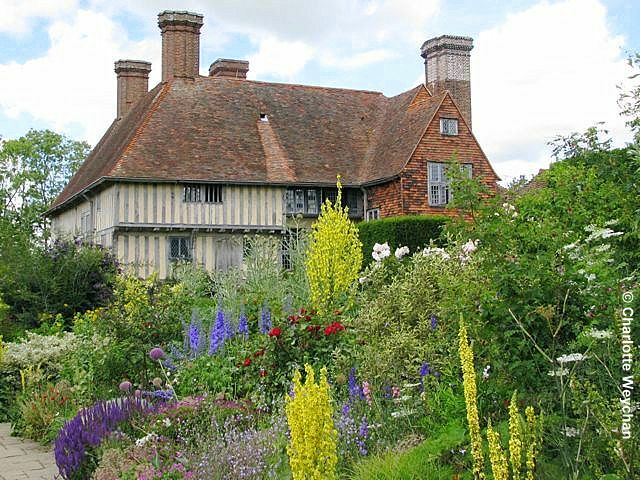 Great Dixter is a member of the Historic Houses Association. The gardens are open daily (not Mondays, except Bank Holidays) from 11.00-17.00, until the end of October. The house is open from 14.00-17.00. There are also a series of events at the gardens, including days with Fergus Garrett, where you can learn about planting, so check website for details. There is also a excellent nursery, which sells many of the plants you see at the property. Beautiful!! Lovely blog ~ I'm now following! So nice to "meet" you! it is sheer delight to take your spring garden walks. I wish I could see English garden in all their phases. Thank you. Just so beautiful...love the dried grasses in front of the hedges and in back of the fresh spring blooms..
What a wonderful stroll through those gardens today. I of course went with you. LOL! So much color. Just beautiful. Thanks for taking us along your stroll, lovely! 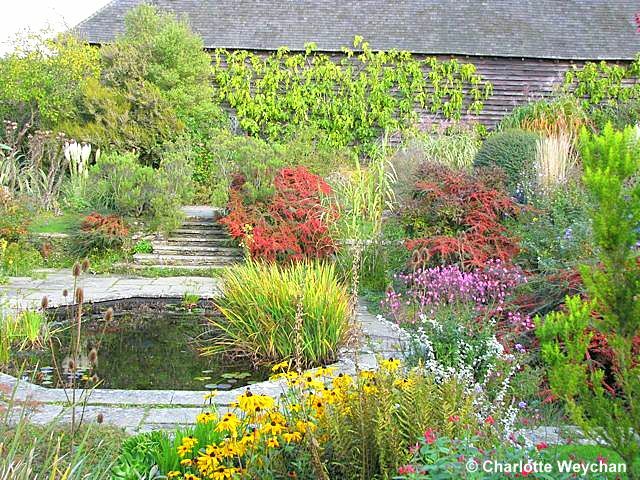 Would love to visit Great Dixter in mudsummer, maybe even autumn for their plant fair. 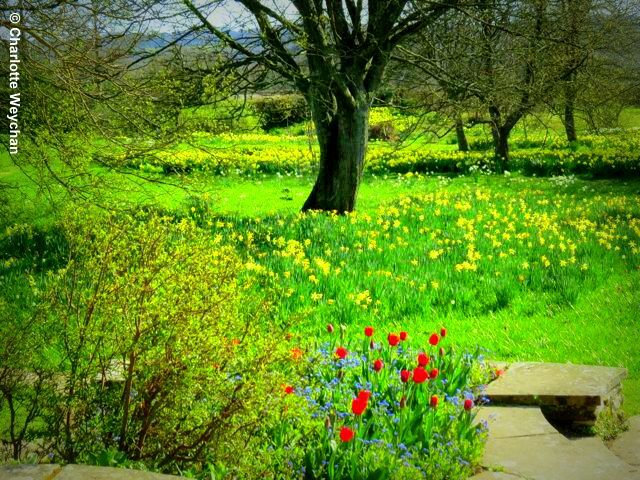 As ever your photos are amazing: particularly one of the orchard meadow. Wonderful garden - the first UK garden visit I plan on making! You might be interested, Charlotte, in checking in on the blog Anemone Times, as Helen there has been doing a series on her experience as a student gardener at Dixter this month. Very fun reading!